The Royal Welsh Show was on last week, the biggest annual agricultural show in Wales. I’ve been a couple of times but I find it a bit odd because I’m a proper townie. 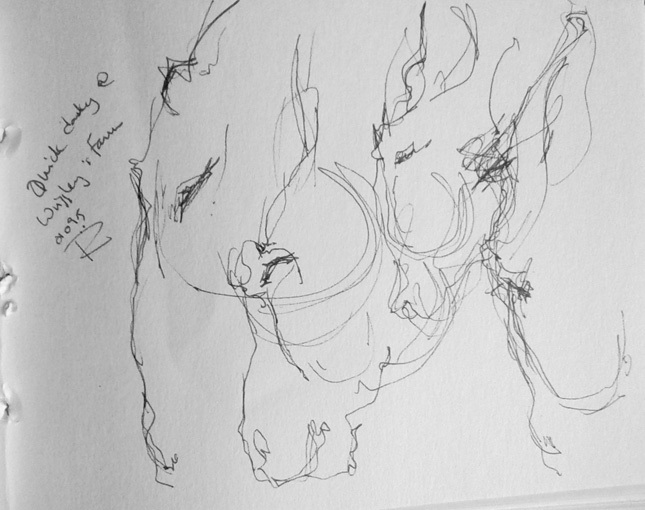 A while back, I visited some chums who raise pigs, in very nice humane conditions, and did some scribbling. One of my sketches became this lino cut of their Mangalitza Boar. Here’s their website, it’s very interesting but perhaps best avoided if you’re vegetarian or vegan. There’s a new online publication called The Eye Magazine all about life in Wales. I spotted this article, a spoof about the Royal Welsh Show. It’s hilarious. Seriously funny. Take a few minutes to read it, it’s only short. It’s called “Twijazzling Furore At The Royal Welsh“. Twijazzling is such a bonkers concept I wouldn’t be surprised if it takes off. Do watch the “Welsh Sheeptacular” video in the article. It’s genius! 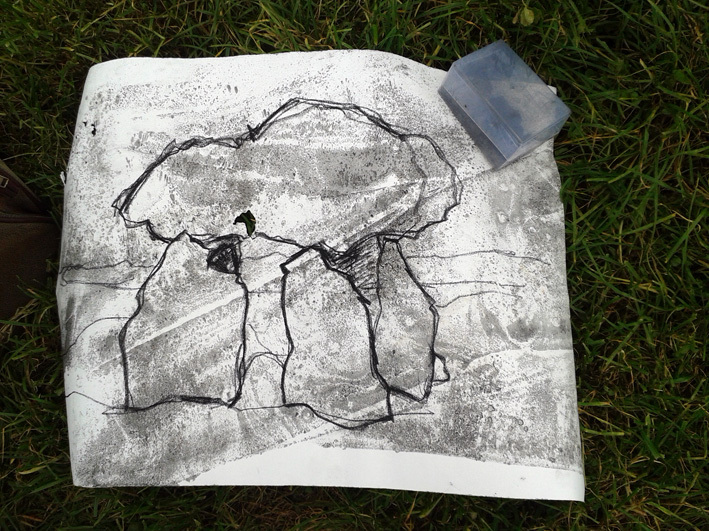 Back on the trail of ancient megaliths with prehistorian Dewi Bowen and filmmaker Melvyn Williams, with my portable drawing board, a folder full of prepared papers and a satchel of drawing materials. We headed out to the Gower Peninsula and pitched up at this magnificent large stone near Weobley Castle. Called Samson’s Jack, or Mansel’s Jack, Dewi described it as “big and priapic” but pointed out that some of its priapic features are now hidden by a thick hedge and barbed wire fence. I found a vantage point to draw from and stepped back into something very squelchy. I’m used to squelchy because the Welsh countryside is covered in many and varied manures rendered squelchy by constant rain, but this was a new variety of squelchiness, it was sheep placenta. There was a lot of it around because the field was home to lots of heavily pregnant and birthing sheep and tiny newborn lambs. I carried on drawing. I’m not put off by squelch and did this drawing with conté crayons and Daler Rowney artist quality soft pastels. The second stone circle at Y Pigwyn on Mynydd Bach Trecastell is a lot more complete than the first, with almost all its stones still in place, although they’re not very big. We took young Nephew with us, he’s a country lad and used to the rough terrain, he found a sheep’s skull, a ram’s horn and balanced on one leg on one of the stones in the circle. 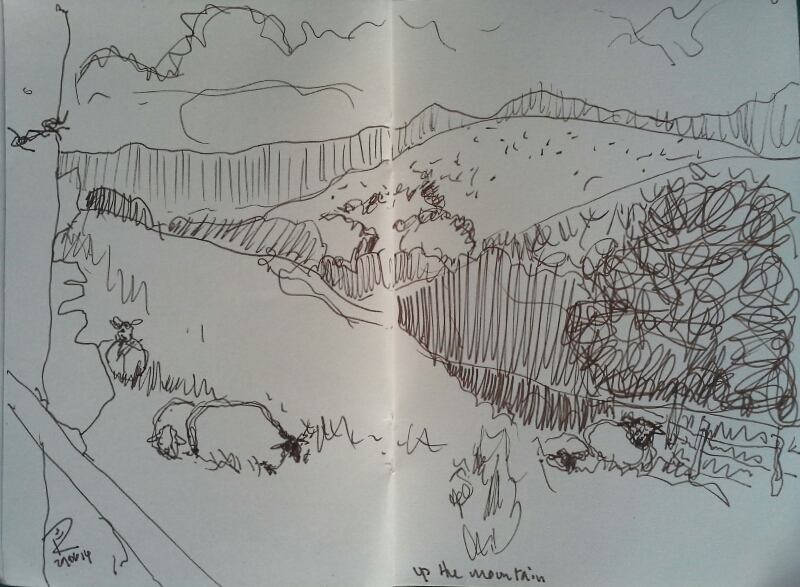 I drew quickly because it was cold and we weren’t sure how long the sunny interval after the gales and hail would last. I became aware how much this series of drawings has been influenced by the environmental conditions surrounding me. Many of them have had to be done quickly and the materials I have used to draw them have had to function in some pretty severe weather. I might produce something different if I return to these sites in the summer. The views from Y Pigwyn are spectacular, even in the appalling weather. It’s fascinating watching the weather systems churning across the vast landscape. There was a lovely old stone wall at the bottom of the field with sheep and newborn lambs behind the wire fence. I’m travelling around South West Wales with archaeologist Dewi Bowen who is researching his new book on Neolithic / Bronze Age monuments. His previous book on the stones of Ancient Siluria (South East Wales) can be found here. Accompanying us is film maker Melvyn Williams who is recording a documentary about our experiences. Some of Melvyn’s short films can be seen here. I’m currently working on a series of expressive drawings of ancestral sites and if you want to see some of my other artworks, please click here. Friday saw another excursion into the bleaker parts of South Wales hunting the wild megalith. The weather forecast predicted sunshine with the occasional shower so I had high hopes for this visit to Mynydd Trecastell / Mynydd Bach to the site called Y Pigwyn which has two Neolithic stone circles and the remains of a Roman camp. The car wouldn’t have made it up the rough track (a four-wheel drive would be fine) so we parked at the cattle grid, had our packed lunch and then set off in the crisp sunshine. Within a few yards along the, possibly, Roman road the weather completely turned, bombarding us with snow, hail, gale force winds and a drastic drop in temperature. We were kitted out for it as even late April can see sudden changes in the weather around here but even so, it took all our resolve to carry on struggling against the vicious headwind for the mile or so to the circles. About halfway along we had to stop and turn our backs to the fierce gale and we discussed turning back but the wind dropped slightly and the wave of heavy hail moved over us and on into the distance so we carried on. I wondered how I would be able to draw as my hands were desperately cold but as we reached the circles, the last of the hail disappeared, the sun came out and warmed us up. The first ‘circle’ we came to is incomplete, with only four remaining standing stones but a number of postholes are still very obvious. There are paths criss-crossing the rough grass, possibly made by people but more likely sheep and two intersected the circle neatly. It was still cold so I had to work quickly. Dewi the archaeologist commented that the mountain had challenged us and we had passed the test. It certainly felt that way. 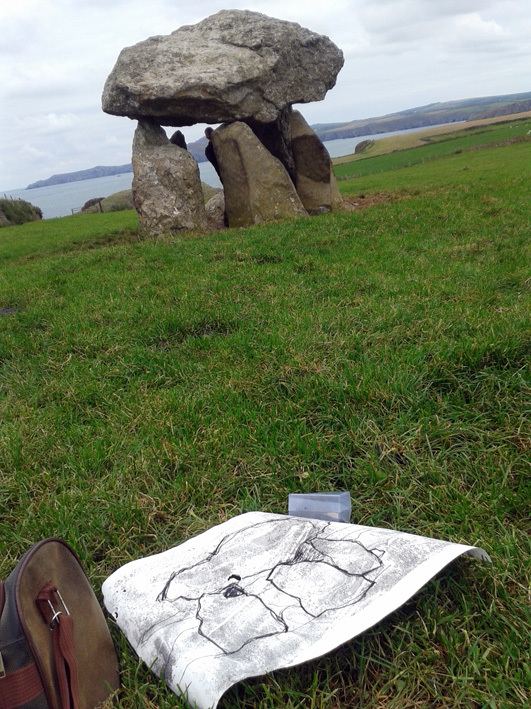 Here’s the fourth ancient burial site I drew over the weekend on my visit to ancestral graves in North Pembrokeshire. 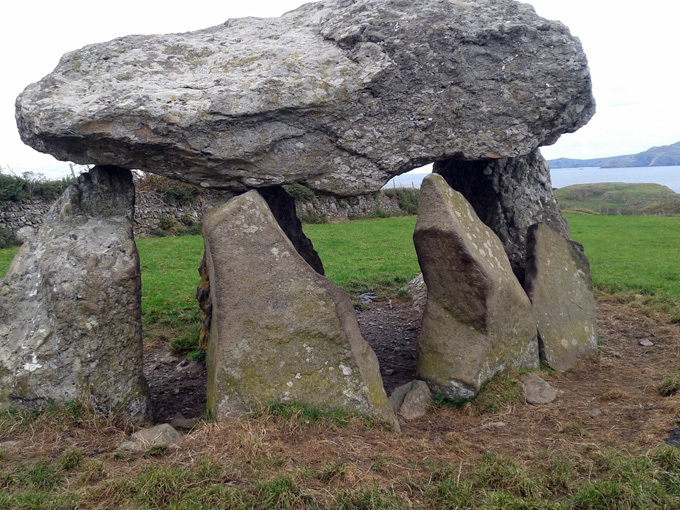 It’s a beautiful little chambered tomb called Carreg Samson, near Abercastle. The dolmen looks out across The Irish Sea from a farmer’s clifftop field in a glorious setting. It’s around 5,000 years old and is the site of over 1,000 burials and more recently a shelter for sheep. I forgot to take a drawing board with me so I scrabbled around on my hands and knees, drawing on the grass. I drew very quickly because it was cold, blustery and uncomfortable. I drew with a piece of Daler Rowney carbon onto a piece of Fabriano Accademica paper (200 gsm) that I had marbled with oil paint mixed with English Turpentine. I like the effect that the marbling gives to these Neolithic stones. It’s been a very busy few weeks, personally and professionally and I haven’t been keeping up with my sketchbook drawings. I should be doing a scribble each day but I’ve lapsed. So today I went back to basics. Husb and I went to a family birthday, our little great-niece is three and we celebrated at Wriggley’s Fun farm, a lovely little petting farm a few miles from Swansea. Out came the sketchbook, my leather steampunk one, with my Faber Castell Pitt drawing pen and scribbling ensued. A lovely, elderly donkey obligingly munched away and a curious sheep stood still with knock knees and watched closely to see if I had any treats for her. I did. They’re only quick scribbles, a few minutes, but they’re a vital part of my art practice because these speedy sketches in real life and real time force me to focus on the essentials rather than the detail and ultimately that’s what underpins everything I do in my work. Another hilarious instalment of this spoof of action heroes in Wales. Marvel / DC, eat your hearts out! 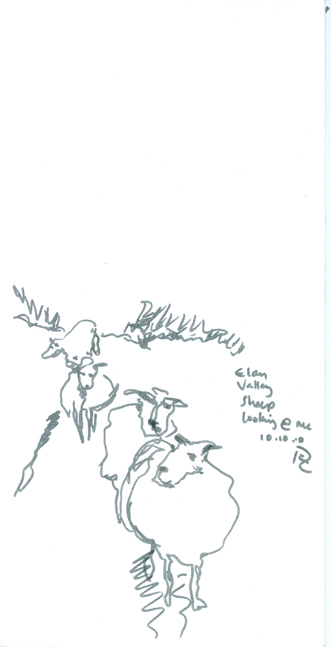 Continuous line drawing: Elan Valley Sheep. b) look at your drawing too often. 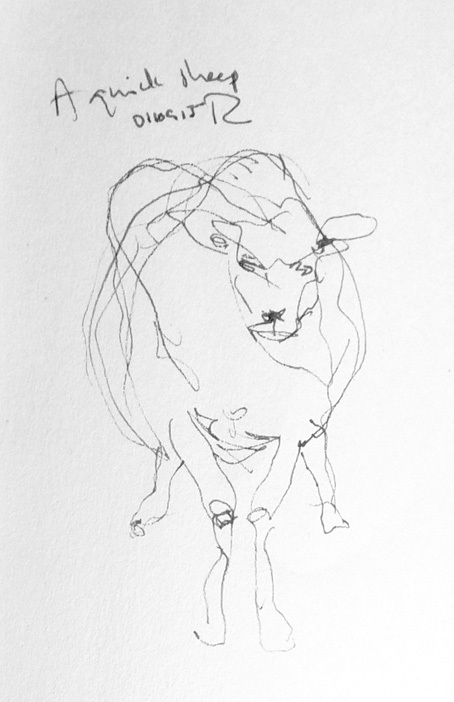 The idea is to keep looking at the subject and ‘feel’ your way quickly around the paper with the point of your pen. You look at the drawing occasionally to stop yourself from going completely off, but resist the temptation to keep checking it and trust yourself! If you keep your pen on the paper, you’ll achieve a flowing line and you’ll often have to go back over bits to get to other parts of the drawing, but that’s all right because you’ll end up with very lively, vibrant lines. You can have a few breaks but try to keep these to a minimum.